There was a recent tweet on Twitter by a user "Graphic Designer" who goes by the handle @Itz_JF. 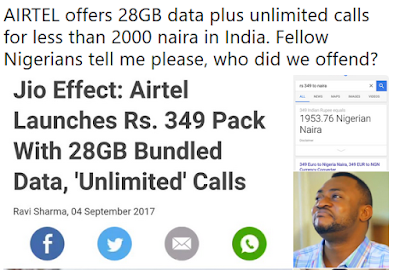 According to him, Airtel Launched a 28GB data plan with unlimited calls in India and the plans comes with 1GB data per day for 28days and it cost just Rs349 Indian rupees which is less than N2,000, while in Nigeria they are offering just 3GB of data loaded with 100Mins of calls to all network for N1700. While many of us might see this as unfair or a double standard from Airtel, I think we should try and put somethings into consideration first before we jump into conclusion. First, Airtel is an Indian owned telecom company and equally the largest mobile operator in India at the moment. While this might not be a tangible excuse to many of us, I think we should consider another important factor which is the cost of operation. India is the third largest producer and fourth largest consumer of electricity in the whole World. While Nigeria on the other hand is nothing to write home about in terms of power sector. Even though telcos in Nigeria make huge profit from the high cost of data and calls, if you consider the amount mobile operators in Nigeria spend in fueling generators used to power numerous network base stations Nationwide, experience centers and others, then you might see why it's difficult for them to make the price of their data plans as cheap as other countries. Even with the pretty expensive data rate, remember the Dubai owned Etisalat (now 9mobile) had to pull out of Nigeria due to huge bank debt which it was unable to pay up and Airtel once had a similar experience (might still have it) sometime ago but was able to scale through narrowly. 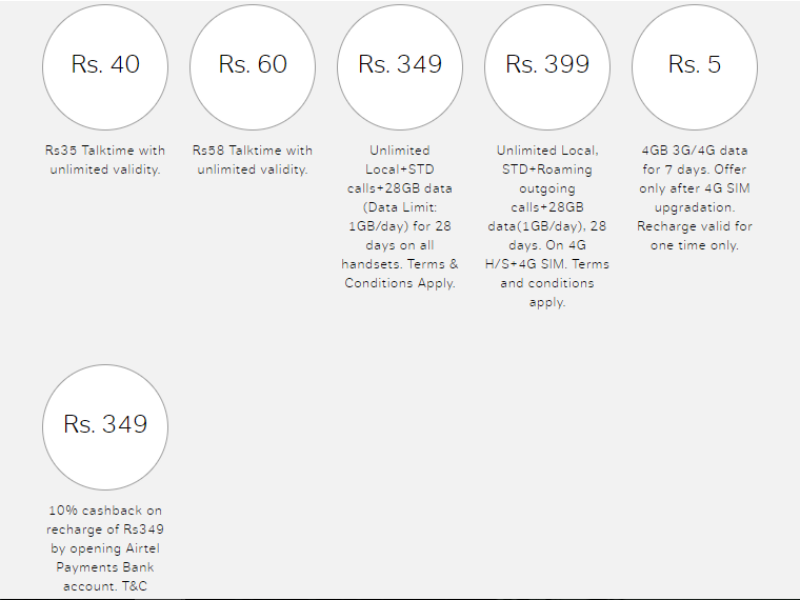 For those who don't know, jio 4g which is the newest commercial mobile operator in India started the data price war by slashing the price of data plans to attract more subscribers, this actually worked as Jio acquired 16 million subscribers within the first month of operations (fastest in the world), crossed 50 million subscriber mark in 83 days, subsequently crossing 100 million subscribers in less than 6 months. This forced India telco giant, Airtel to follow suite and led to the current data price war in India in which the subscibers are the highest gainers. If you remember, Glo started something similar in Nigeria early last year when it slashed the price of data plans which forced other network providers to do the same and subsequently led to a competition of who can provide the cheapest data plan in the country. The competition/data war was going well mostly for we the subscribers until NCC shocked everyone when it mandated all telecommunication companies in Nigeria to increase the price of their data plan as it was too cheap. Although that didn't push through all thanks to the intervention of the Senate, but it actually ended the competition which was beginning to affect the data subscribers positively and even Glo who started it all took a U turn by reducing their data volume by 50% across all their Available data plans making it twice as expensive as it was last year. So while we all wish we can enjoy the same service as other countries for the same rate or maybe cheaper, we might want to consider the working environment our country actually offers compared to those other countries. Remember that this is just my own thought on this issue, if you disagree with my points or you just have something to add then feel free to share it in the comment section below.